HUGE BUZZ AND LENGTHY QUEUES SURROUNDING NEW APPLE PRODUCTS AT IAAPA! Greenvale, NY, December 2018 – Apple Industries was delighted to exhibit at IAAPA (International Association of Amusement and Attractions) for its 17th consecutive year. IAAPA is well known in the Amusement World for debuting innovation and cutting-edge technology while adhering to what amusement professionals need to be more competitive and profitable. Apple Industries lived up to this reputation with a new take on its annual exhibit booth. There is a strong chance that the “Marvel Adventure Lab” will be considered the most innovative photo-vending product of 2019. Apple COO Scott Avery revealed “This is an exclusive amusement machine concept developed by Apple Industries in partnership with MARVEL! The in-house software technology and magical interface create the most unforgettable user-experience ever witnessed within an amusement machine. This is truly unique and amazing “. IAAPA visitors were waiting in line in front of the “Marvel Adventure Lab” for a chance to use the booth and become part of a customized comic book with Marvel characters (Spiderman, Ant Man, Thor, Black Panther, Captain America, Guardians of The Galaxy, The Avengers, Iron Man, Hulk). Additional fun at the show came from Apple’s latest Face Place photobooth “Photo Studio Prism™”, a compact new version of Photo Studio Deluxe™. “Due to its monumental size, the popular Photo Studio Deluxe™ could only be installed in very large environments,” said Apple CEO, Allen Weisberg, “and following so many requests from our loyal partners and distributors, we decided to develop “Photo Studio Prism™”, a smaller and more compact version to fit within many more locations”. Visitors were also waiting in line to use the “Photo Studio Prism™” and enjoy interactive videos such as “Santa”, a festive experience to take a picture with Santa Claus! Apple Industries also revealed a brand new licensed content including Universal properties such as “Trolls”, “Jurassic Park”, “Back to the Future”, “Fast & Furious”, just to name a few. 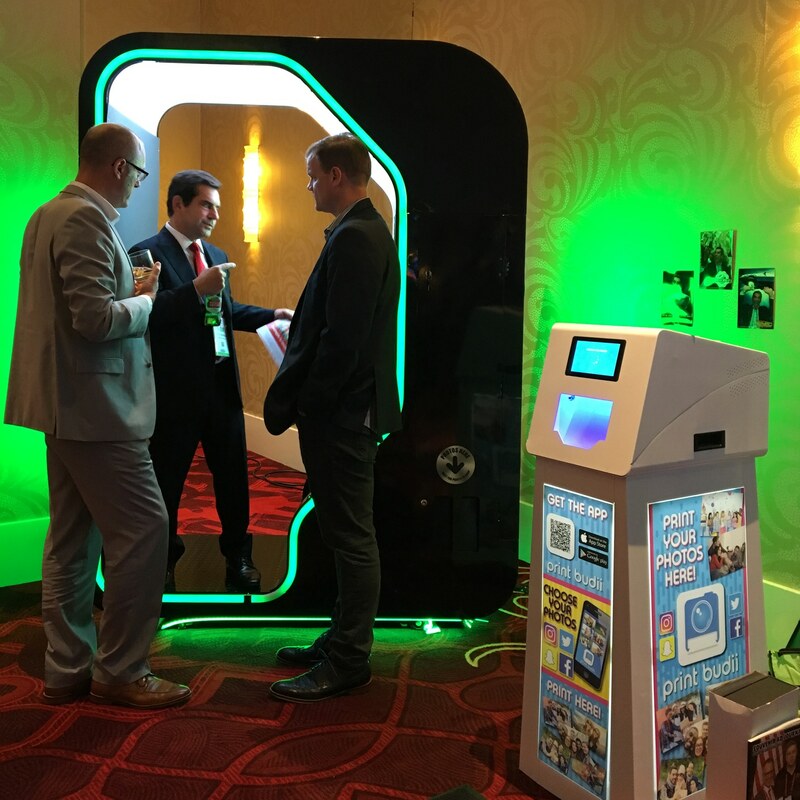 One would think that both new products would be enough for Apple to launch at IAAPA, but the Company raised the bar with another surprise: “Print Budii”, the new Apple Industries’ division dedicated to digital photo printing via self-service kiosks. “Print Budii™ is the world’s first app-powered printing kiosk,” explained Apple COO Scott Avery. “Print Budii™ App enables customers to use their smartphone to access photo galleries and social media, then customize, transfer and print photos! All done by phone!” added Scott. With the Print Budii App, IAAPA visitors printed thousands of photos from the kiosks installed on the exhibit booth over the course of four days. The kiosk is very easy to install and plugs into any standard outlet. Print Budii owners can add their own localized content including promotional and fun overlays. This option will help our partners to raise brand awareness on Social Media as customers can share their customized photo on Facebook, Instagram, or Twitter! So, watch this space, Apple Industries will continue to update us on the roll-out of their new products while still working on exciting new ideas for next year at IAAPA Expo.